You must have your own CentOS virtual machine (with root permissions) running to do this lab. You cannot do the lab on the Course Linux Server because you do not have root permissions on that machine. The original Assignment 13 has been split into two smaller pieces – 13 and 14 – to make the checking script simpler. This Assignment 14 is the second half of Assignment 13. College policy does not allow assignments to be due after the term ends on December 6. Late assignments or wrong file names may not be marked. Be accurate. This is a Bonus assignment worth extra marks. Completed CentOS Virtual Machine installation. Completed CentOS VMware Tools installation. An ability to READ ALL THE WORDS to work effectively! One text file uploaded to Blackboard according to the steps in the Checking Program section below. Accounts and directory structure created and left for marking on your own CentOS Virtual Machine. WARNING: Some inattentive students upload Assignment #14 into the Assignment #13 upload area. Don’t make that mistake! Be exact. Practice managing Booting and GRUB in your own virtual machine. This is a BONUS assignment for extra credit. Do not print this assignment on paper. On paper, you cannot follow any of the hyperlink URLs that lead you to hints and course notes relevant to answering a question. You also don’t get any of the later updates to the assignment. Do not print this assignment on paper. Do the Tasks listed below, in order. Since I also do manual marking of student assignments, your final mark may not be the same as the mark submitted using the current version of the Checking Program. I do not guarantee that any version of the Checking Program will find all the errors in your work. Complete your assignments according to the specifications, not according to the incomplete set of mistakes detected by the Checking Program. When you are finished the tasks, leave the files and directories in place as part of your deliverables. Do not delete any assignment work until after the term is over! Assignments may be re-marked at any time; you must have your term work available right until term end. All references to the “Source Directory” below are to the CLS directory ~idallen/cst8207/13f/assignment14/ and that name starts with a tilde character ~ followed by a userid with no intervening slash. The leading tilde indicates to the shell that the pathname starts with the HOME directory of the account idallen (seven letters). Most of the commands in this assignment require root privilege. Use the sudo command to run individual commands as root – don’t use a root subshell. If you start a root subshell (not recommended – use sudo instead), your prompt will tell you if you are the root user by changing to include a # character instead of a $ character. You can also use the commands id or whoami to show your current userid. Take a snapshot of your virtual machine before you begin each section of this lab so that you can recover back to the snapshot if needed. You can delete the unused snapshots if everything works well. Where you are required to record or save a command line or its output into The Answer File, do the command and then copy and record the command line or its output as a separate line into an answer.txt file in your CentOS assignment14 directory. You will be told how many lines to save in the file. Pay attention as to which tasks must be done in your own CentOS Virtual Machine and which must be done in your account on the Course Linux Server. Your instructor will mark on the due date the work you have in your account on the CLS. Leave all your work on the CLS and do not modify it. Do not delete any assignment work from the CLS or your CentOS VM until after the course is over. Create your assignment14 directory on the CLS in the usual place. Create your sysadmin account assignment14 directory on your CentOS VM in the usual place (not in the root account!). This CentOS directory is the base directory for all pathnames in this assignment. Store your files and answers here on CentOS. Before you begin this assignment, create a snapshot of your CentOS Virtual Machine, as mentioned above. Enter a comment explaining where and when you took this snapshot. You can restore back to this snapshot if anything goes wrong. This section depends on a successful CentOS Virtual Machine installation, including a working GRUB menu. To change a forgotten root password or do maintenance on the system that requires it to be quiescent, you can boot your system in a restricted single-user mode that does not start many system daemons and goes directly into a root shell prompt on the system console without requiring a password. The system should not be left in single-user mode; many things are not started. You may not even be able to log-in remotely in single-user mode. View your CentOS GRUB configuration file and look at the kernel line in that file. Note all the options used on the kernel line; you will see them again soon. Record on Line 1 in The Answer File the Linux absolute pathname of this GRUB configuration file. 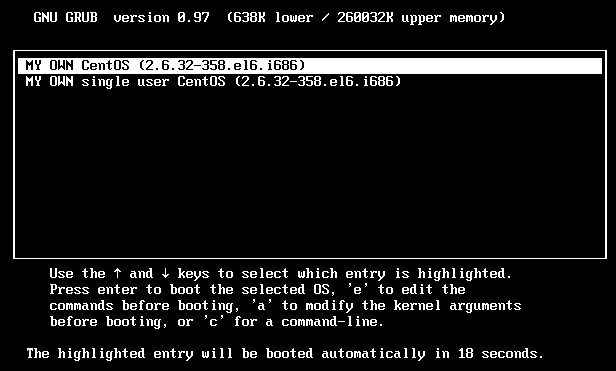 Safely reboot your CentOS VM into the GRUB menu. When the boot process begins, if you correctly disabled the hiddenmenu command in GRUB, you will boot directly to the GNU GRUB menu where you should see a one-line list of CentOS systems to boot and at the bottom a 30 second countdown in progress. Now, just as the GRUB menu instructions tell you, to modify the kernel arguments you press just the single letter a – just the letter key, no [Enter] key! After pressing a you will see your cursor on a line that ends with the same kernel arguments you viewed earlier in the configuration file. 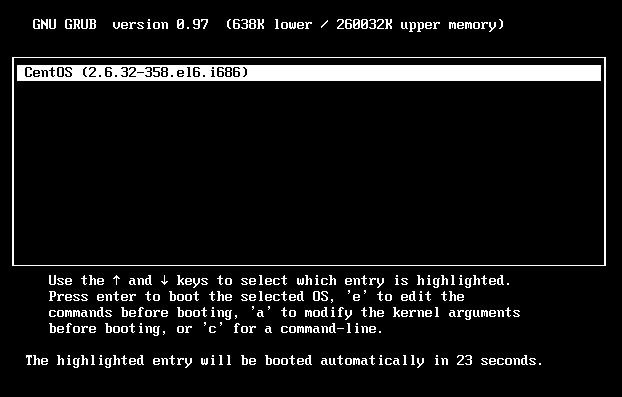 You can use the [Home] key to zoom to the left end of the kernel options line, and the [End] key to zoom to the right. As the instructions say, push [Enter] to accept your changes and directly boot the system using these new kernel options. These changes to the kernel options are not saved back into the configuration file – they are only in effect for this boot menu. You can perform any root function at this prompt, including changing passwords (even the root password). Often single-user mode has no networking enabled and only a minimal number of file systems mounted. Use the command that displays the previous and current Run Level (two words on one line) and record this line of output as Line 3 in The Answer File. Leave single-user mode and let the system finish booting into full multi-user mode. The login prompt should appear on the console. Leaving single-user mode does not mean rebooting the machine. Do not reboot or shut down the machine. Log in as your sysadmin account (optionally use an SSH login, not the terrible console window) and repeat the command that displays the previous and current Run Level and save the output as Line 4 in The Answer File (two more words on one line). Check your work using the Checking Program. Record the number of lines in a standard Linux boot menu entry as Line 5 in The Answer File (one number). Record the Linux absolute pathname of the new file as Line 6 in The Answer File. Record as Line 7 in The Answer File a GRUB pathname (using GRUB syntax) that refers to your new myconfig GRUB configuration file in its correct partition. Your current CentOS GRUB configuration file contains only a single boot menu entry for one Linux kernel. We will now create a new GRUB configuration file with a second boot menu entry. In your running CentOS VM, copy your myconfig configuration file to a new file named newconfig in its same grub directory. Record the Linux absolute pathname of the new file as Line 8 in The Answer File. When you have the preview working, safely reboot and run your new GRUB newconfig configuration file using the same method as you did earlier to run tye myconfig file. In multi-user mode, log in as your sysadmin account (optionally use an SSH login, not the terrible console window) and check your work so far using the Checking Program. See the section on Legacy Run Levels and Services in the Booting and GRUB page. As with most system maintenance activities, you will need to use the sudo command to run the privileged commands in this section. Record as Line 9 in The Answer File the Linux absolute pathname of the system configuration file that gives the default Run Level for your CentOS system. The lvm2-monitor service will complain that it is too dangerous to shut down. Use the command that displays the previous and current Run Level (two words on one line) and record this line of output as Line 11 in The Answer File. How do you know which System Log Files were modified most recently? Those log files are the files you should look in for the log message. When you find the right log file name, record the Linux absolute pathname of the correct log file as Line 12 in The Answer File. Record this last ntpdate log message as Line 13 in The Answer File. Use the command that displays the previous and current Run Level (two words on one line) and record this line of output as Line 14 in The Answer File. See the section on Starting and Stopping Services in the Booting and GRUB page. As with most system maintenance activities, you will need to use the sudo command to run the privileged commands in this section. The output of the command will include the pid of the service and say that it is running. Record the one line of output (with the pid) as Line 15 in The Answer File. The output of the command will say that the service is stopped. Your Linux kernel has a version number, as in “What version of the kernel are you running? I’m running version 2.6.32”. Unfortunately, the command that prints system information, including the kernel version number, calls the number a kernel release number, because it uses the option name version to stand for the kernel compile date. When using this system information command to display the kernel version number, you must use the option for release. Record the command line you must use as Line 17 in The Answer File. Summary: Do some tasks, then run the Fetch and checking program to verify your work as you go. You can run the Fetch and checking program as often as you want. When you have the best mark, upload the marks file to Blackboard. The checking program resides on the Course Linux Server, but your work is on your CentOS Virtual Machine. There is a new Fetch program that you must download and use on your CentOS Virtual Machine to copy information from your CentOS Virtual Machine to your account on the CLS so that the checking program can check it on the CLS. Once the Fetch program has fetched these files from your Virtual Machine to the CLS, you can run the checking program on the CLS to check what is saved in the files. When you make changes on your CentOS Virtual Machine, you need to run the Fetch program again on CentOS to update the saved files on the CLS. Simply running the checking program on the CLS will not update the saved files on the CLS. You must run the Fetch program below on your CentOS VM when you make changes on your CentOS Virtual Machine. Do all the following steps on your CentOS Virtual Machine. Read through the whole list before you start typing anything. An example of what to type is given below the descriptions that follow. Log in to CentOS using your system administrator (non-root) account. Change to your existing CentOS assignment14 directory containing all your answer files for this assignment. As shown below, use curl to get a copy of the Fetch program from the given URL into a file named do.sh. Make sure you end up with a file named do.sh in your assignment14 directory. Make sure the downloaded file is not a file of HTML and errors. It should start with #!/bin/sh and contain a few shell comments and commands, including another curl command. You only need to download this Fetch program once per assignment. As shown below, use sudo to run the do.sh script you just downloaded to CentOS, with the USER environment variable set to your own College/Blackboard/CLS account userid (do not use abcd0001). You can run the do.sh script over and over to check your work. This Fetch program will connect from CentOS to the CLS using your account name. It will copy files from CentOS to your assignment14 directory on the CLS. It will then run the checking program on the CLS to check your work. You will need to answer one question about your IP address, and then wait and type in your CLS password. idallen-ubuntu assignment14fetch_server.sh version 4 run by abcd0001. VM files collected into CST8207-13F/Assignments/assignment14/abcd0001.tar.bz on CLS. You can use sudo to run the do.sh script over and over to check your work. You only need to run the curl line once, to get the do.sh script. This Fetch program updates your saved files on the CLS and then runs the checking program on the CLS. If you only run the checking program on the CLS, it won’t update the files from your CentOS VM and it will just check the exiting files saved under assignment14 on the CLS. The checking program is running on the CLS, not on your CentOS VM. At the start, the checking program will issue messages relevant to your account on the CLS (e.g. errors in your CLS .bashrc file or world-writable files on the CLS). These errors are on the CLS, not on your CentOS machine. There is a Checking Program named assignment14check in the Source Directory on the CLS. Create a Symbolic Link to this program named check under your new assignment14 directory on the CLS so that you can easily run the program to check your work and assign your work a mark on the CLS. Note: You can create a symbolic link to this executable program but you do not have permission to read or copy the program file. Remember: The checking program does not fetch new files to the CLS from your CentOS VM. You must run the Fetch program on your CentOS VM to update the fetched files on the CLS so that the checking program can mark them on the CLS. You may run the “check” program as many times as you wish, to correct mistakes and get the best mark. Some tasks sections require you to finish the whole section before running the checking program at the end; you may not always be able to run the checking program successfully after every single task step. When you are done with checking this assignment, and you like what you see on your screen, redirect the output of the Checking Program into the text file assignment14.txt under your assignment14 directory on the CLS. Use the exact name assignment14.txt in your assignment14 directory. Case (upper/lower case letters) matters. Be absolutely accurate, as if your marks depended on it. Do not edit the file. Make sure the file actually contains the output of the checking program! Transfer the above assignment14.txt file from the CLS to your local computer and verify that the file still contains all the output from the checking program. Do not edit this file! No empty files, please! Edited or damaged files will not be marked. You may want to refer to your File Transfer notes. Submit the assignment14.txt file under the correct Assignment area on Blackboard (with the exact name) before the due date. Upload the file via the assignment14 “Upload Assignment” facility in Blackboard: click on the underlined assignment14 link in Blackboard. Use “Attach File” and “Submit” to upload your plain text file. Your instructor may also mark the assignment14 directory in your CLS account after the due date. Leave everything there on the CLS. Do not delete any assignment work from the CLS until after the term is over! Your instructor may also mark the files on your CentOS VM after the due date. Leave everything there on your CentOS VM. Do not delete any assignment work from the CentOS VM until after the term is over! Use the exact file name given above. Upload only one single file of plain text, not HTML, not MSWord. No fonts, no word-processing. Plain text only. Did I mention that the format is plain text (suitable for VIM/Nano/Pico/Gedit or Notepad)? No marks are awarded for submitting under the wrong assignment number or for using the wrong file name. Use the exact name given above.